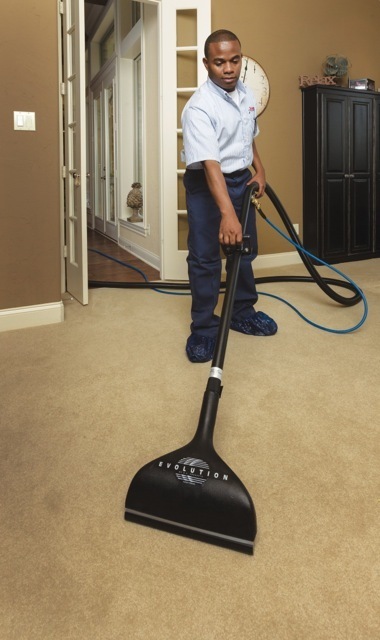 Keeping your carpets clean is important not only because you want to keep your home looking good, but also because you want your carpet to last as long as possible. The following are a few spot and stain removal tips to help you keep your carpeting looking as good as new for years to come. Even common stains like beer, ketchup, and crayons can be difficult to remove. Consult our Carpet Stain Guide for tips on how to deal with a variety of stains. Remember, the only way to guarantee complete stain and odor removal is to call the professionals. Don't rub the stain - Frantically rubbing the stain can not only cause the stain to be driven further into the carpet, but it could cause damage to the carpet's material. Don't start at the center - By trying to blot or scrub from the center of the stain, you'll take the risk of spreading the stain even more. You should always wipe or blot from the outside in. Don't use hot water - Hot water will just cause the stain's structure to change, which can result in it bonding with the surface of your carpet. Don't use harsh cleaning solutions - Always try using mild detergents or water first. Harsh cleaning solutions can damage the carpeting. While many stains can be removed using home remedies, particularly bad stains should be removed by a professional service such as Rainbow International®. If the previous spot and stain removal tips fail, than the last thing you should do is attempt more severe methods as this can damage your carpet. Rainbow International has the products and the experience to treat even the most difficult stains and spots. Even if the stain is permanent, Rainbow International may be able to replace a small portion of the carpet with another piece, thereby avoiding the need to replace the entire carpet. Contact Rainbow International today for more information regarding spot and stain removal.